'Thank you for being a friend!' Deadpool's undying love for all things The Golden Girls is no secret. And now the last remaining actress from the iconic sitcom is giving that love right back. Betty White has taken to her personal Twitter page to share her review of the Marvel movie. And guess what? She loves it! "I love @VancityReynolds...here are a few of my thoughts about his new movie #Deadpool. It was glorious! Once in a generation, a movie comes along that your whole family will love...If your family is a (bleep)-ed up group of (bleep) kissing inbreds. Plus, Ryan Reynolds looks so (bleep)-ing handsome in his leather suit. I give it four Golden Girls. It's the best picture of the year. So, go see Deadpool this Friday!" The Merc with the Mouth has had a fascination with Bea Arthur for years in the Marvel comics. And it's been a running gag to this day. The masked assassin has fallen hard for quite a few ladies over the years. But not like this. Bea Arthur is his one true love, and he proves that in the Deadpool movie by naming his swords after her. The movie even payed tribute to the show's 30th Anniversary earlier this year, in the form of macrame dolls. The Bea Arthur/Deadpool relationship dates back to writer Fabian Nicieza's work on 'Deadpool & Cable', with the series often honoring the beauty of the late actress. It is a passion that has come back many times over the years. 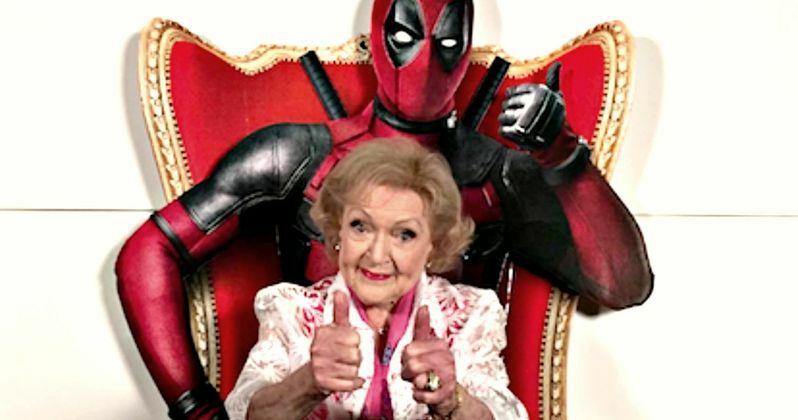 Sometimes Deadpool hallucinates the The Golden Girls' star's image. And though his two swords are named Bea and Arthur in the movie, in the comics, members of the Deadpool Corps. named their ship after the iconic leading lady of Maude. Based upon Marvel Comics' most unconventional anti-hero, Deadpool tells the origin story of former Special Forces operative turned mercenary Wade Wilson, who after being subjected to a rogue experiment that leaves him with accelerated healing powers, adopts the alter ego Deadpool. Armed with his new abilities and a dark, twisted sense of humor, Deadpool hunts down the man who nearly destroyed his life. Deadpool has just been Certified Fresh by Rotten Tomatoes. The long-anticipated movie is coming to theaters tonight!